Wedding trends come and go, and it can be especially difficult when you are planning a year ahead — but from what we can tell, these wedding trends are here to stay. If you’re preparing for a 2019 wedding, here are some of our predictions and the perfect venues for your themed ceremony, all located within Resorts World Sentosa. Greenery was Pantone’s colour of the year in 2017, and its popularity shows no sign of waning. Several 2017 and 2018 brides have embraced the revitalising shade, eschewing roses and other blossoms for ferns and foliage. A new-found ethos of eco-consciousness has also inspired a love for the outdoors and sustainable, nature-themed weddings, which definitely isn’t going away anytime soon. Let nature in as you exchange your vows under cerulean skies, or with a sprinkling of stars overhead. Equarius Hotel’s perfectly manicured lawn sets the scene for the romantic garden ceremony you’ve always dreamed of, followed by al fresco dining in the company of loved ones and lush flora. The spacious lawn accommodates up to 250 guests, and is the perfect canvas on which to bring your dream wedding to life—it's all up to whether you prefer a quirky, vintage themed reception, or a romantic, fairytale-inspired ceremony. AV equipment and Intel lights can also be set up upon request. Take your love for nature to a whole new level at the TreeTop Loft. After all, haven’t we all dreamed of living in a tree house at some point in our childhoods? As you proceed to the next milestone of your life, bid farewell to your adolescence with a unique treetop wedding, perched 12 metres above ground and tucked away in the canopy. This intimate space—featuring a living room, an en-suite bedroom, and an outdoor terrace—allows you to share your special moment with the ones who really matter, and a personal butler ensures all your needs are met during your stay. It used to be popular for couples to travel for their wedding photo shoots, but many young couples are now opting to hold their entire weddings overseas, with destinations ranging from nearby islands to picturesque cities further from home. Who doesn’t love the idea of zipping off to an exotic land for an unforgettable experience and picture-perfect photos? But if jetting off simply isn’t an option, here are a few one-of-a-kind wedding venues right on your doorstep that are sure to leave an impression. One of the world’s largest aquariums, the S.E.A. Aquarium isn’t just a great place for dates—it’s also picture-perfect for a wedding. For an intimate solemnisation, the Ocean Dome boasts a glass-domed ceiling that lets in filtered light, such that the room is bathed in a mesmerising blue glow. Pristine all-round viewing panels transport you and your 60 guests to a fantastical ceremony under the sea. The party continues at the Ocean Gallery—which hosts up to 240 guests, if you are out to impress—a stunning three-tiered gallery that offers panoramic views of myriads of colourful and wondrous marine creatures through a 36-metre by 8.3-metre glass panel. Image Courtesy of: Universal Studios; Universal Studios Singapore™, Universal Globe logo, and all Universal elements and related indicia TM & © Universal Studios. All Rights Reserved. Take your wedding to the streets of New York—no plane ticket needed. Universal Studios Singapore™ offers unique celebration opportunities that you won’t be able to get elsewhere, like dining in the middle of the street with up to 250 guests, right in front of New York Public Library. Let the impressive facade and iconic landmarks of the American city set the stage for a union to remember, and treat your friends and family to exhilarating rides. Who doesn’t love a trip to the theme park? More couples are developing a preference for small-scaled nuptials, sharing their special day with only their immediate families and loved ones. But opting for an intimate ceremony doesn’t mean your celebration has to be any less memorable. Here are some great venues for a small but unforgettable wedding. You don't have to whisk your friends and family to Bali or the Maldives for a private beach-side wedding. After all, Singapore has its fair share of beautiful beaches—most of which can be found right on Sentosa. Tucked away on the western tip of the island, Resorts World Sentosa's Beach Villas set the scene for your intimate wedding-by-the-sea, offering expansive views of the coastline and idyllic island scenery. Check in to one of the many villas, which boast a spacious living room, private timber sundecks, a private lap pool (for two-bedroom villas and above), and oversized bedroom(s)—perfect for hosting loved ones. The venue's resort-style decor also makes the idyllic backdrop for that boho chic wedding gown you have your eye on. Make sustainability and healthy eating the highlight of your wedding, with a farm-to-table menu of fresh, organic, and responsibly-sourced ingredients. Helmed by celebrity chef Ian Kittichai from Thailand, Tangerine guarantees that your guests will be treated to a nutritious and gastronomic feast of classic flavours that also aim to reinvigorate the body and relax the mind. The elegant restaurant, with its floor-to-ceiling glass panels looking out onto lush green gardens, also makes for a quaint venue, tucked away from the bustle of city life. The time-honoured wedding reception never gets old, and ballrooms remain a popular choice for wedding banquets, especially for couples looking to host a large party of guests. What’s even better is that most ballrooms are equipped with state-of-the-art audio and visual equipment, which provides you with countless options when it comes to entertaining your guests. If you’re looking for a space that will really impress, the pillarless Resorts World Ballroom—the region’s largest—takes the cake with 6,000 square metres of space, which means you’ll have no problem fitting in all 4,500 of your guests. With its regal colour palette, plush carpeting, and atmospheric lighting, this venue is perfect for a majestic wedding banquet. Don’t worry if you have a smaller guest list, though. The size of the ballroom is configurable to individual needs. Otherwise, Resorts World Sentosa has a total of 21 function rooms to choose from, each offering access to private outdoor areas of FestiveWalk. Four rooms can also be combined to create a Junior Ballroom that seats up to 320 guests, complete with light, audio and video facilities. 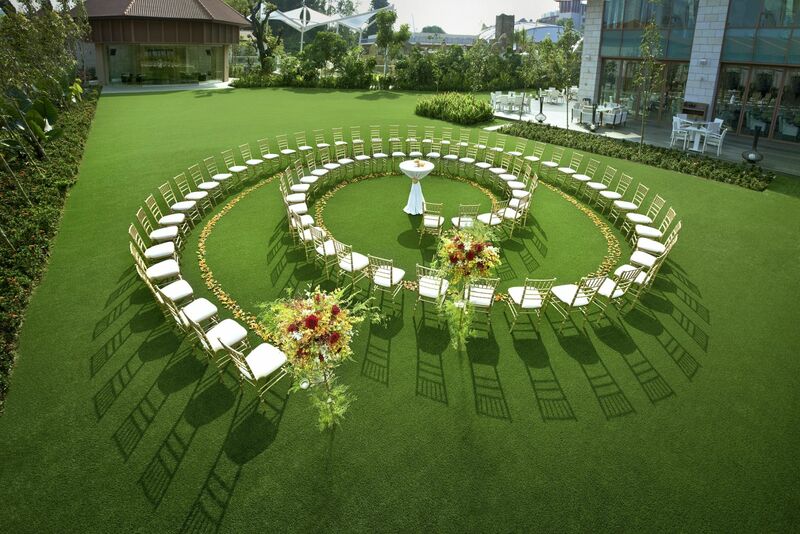 For more information, call +65 6577 6868, or email weddings@rwsentosa.com.